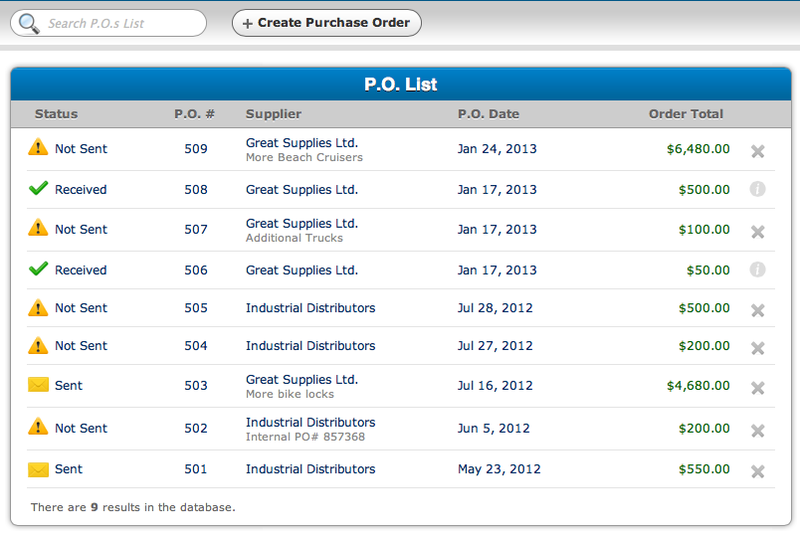 Allows you to send orders to your suppliers and replenish your available stock. Track Your Purchases. Know When New Stock Will Arrive. 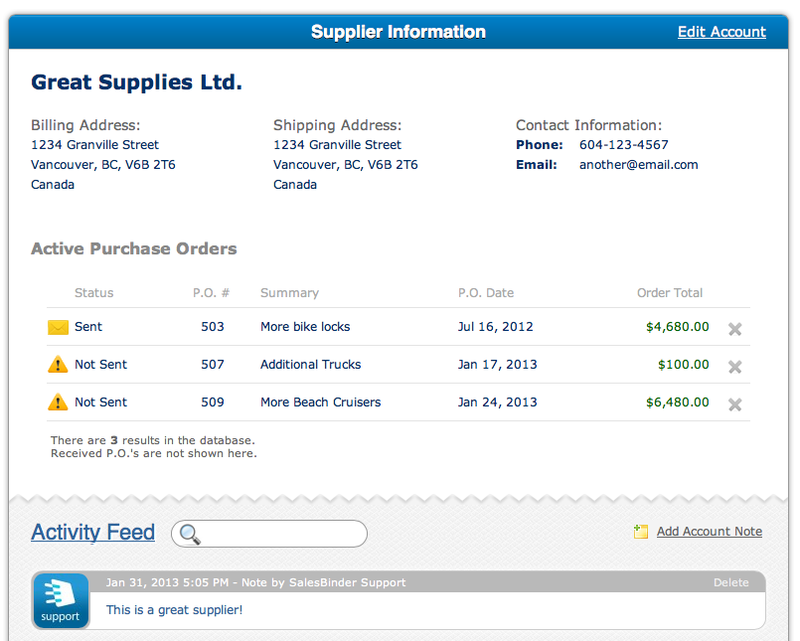 Creating purchase orders with SalesBinder is fast. Simply choose a location, a supplier, then SalesBinder will present you with a list of items offered by your supplier (based off your inventory list). 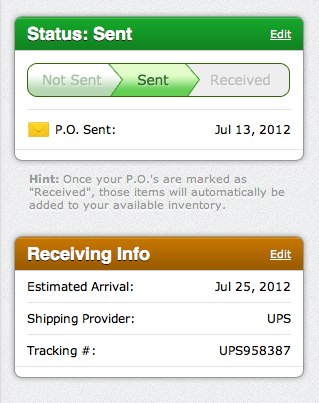 This ensures you only order items from the correct supplier, and they all get sent to the correct location. 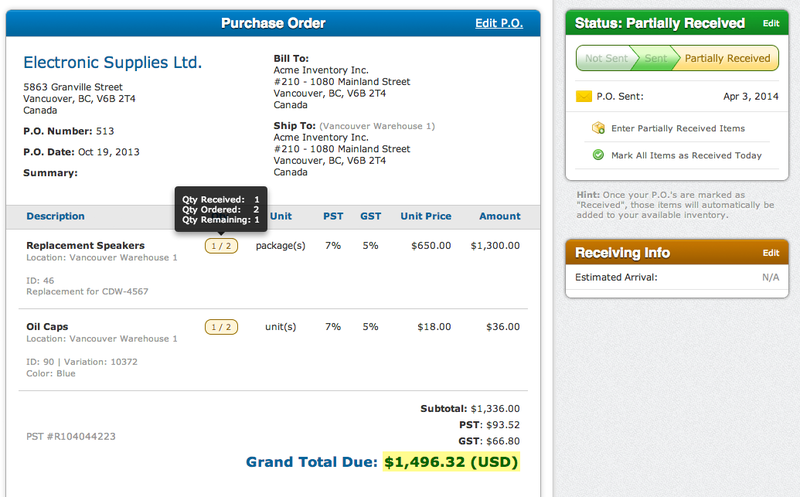 Mark a purchase order as "received", and the items from that P.O will automatically be added into your available stock. If the price per unit is different, we'll automatically calculate your "Averaged Weighted Cost" per unit as well as your latest cost per unit. Create drop shipped P.O's and have your suppliers ship out goods directly to your customer - bypassing the need to stock those items in your inventory. Receive pieces of stock in multiple shipments for a specific purchase order. Quickly see how many items you ordered, how many your received, and how many more remain until the purchase order can be marked as "received in full". Update your purchase orders with the latest information so everyone knows when P.O's have been sent, when the items are due to arrive, or when they did arrive. Quickly review your entire list of P.O's and see what their statuses are. Instantly search by P.O Number or Supplier. InventoryThe easiest and most beautiful inventory you've ever seen. Barcode ScanningUse a barcode scanner to create orders and lookup information. Item VariationsDefine specific quantities based on varying attributes. AccountsCustomers, prospects, and suppliers. In one convenient place. 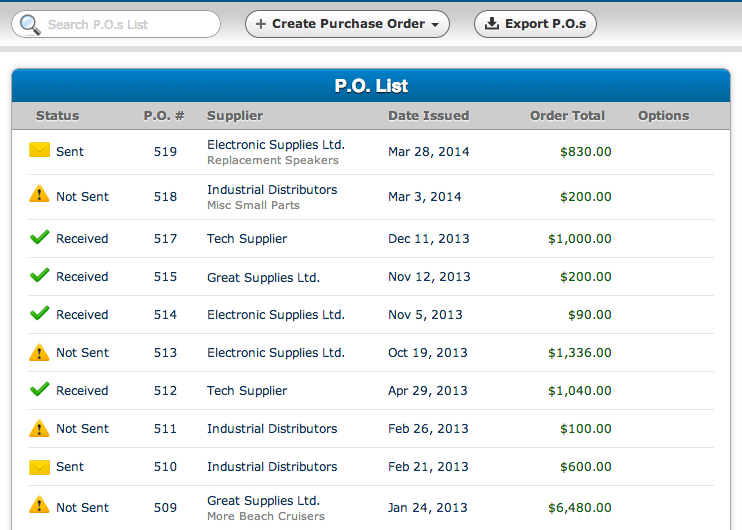 Orders & BillingCreate estimates and invoices then let SalesBinder do the rest. Purchase OrdersReplenish stock levels, track when they should arrive. Locations & ZonesMultiple locations? No problem. Unify your location's inventory. ReportingView detailed reports for financial inventory breakdowns. User PermissionsFinely tune what each of your team members can see and do. IntegrationsSalesBinder speaks nicely to other software and websites.